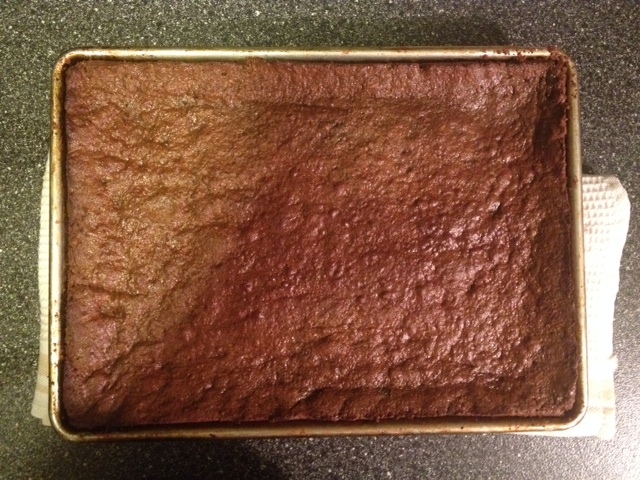 This cake is so easy and delicious I have to share the recipe. I've made it for two cleanse groups now and they loved it. This is for anyone that has a sweet tooth and wants a treat they won't feel guilty about. Because sometimes you just want to eat something bread like / cake like that isn't actually bread or cake. I'm all about indulging in things you love and fully support eating bread and cake if that works for you, don't get me wrong. But I also love being able to whip something up and feed it to my son and know it's not empty calories. And for those times when you are really sticking to that alkaline diet and doing your body right : this is for you. You'll think it's the best thing on earth. If you try it, do let me know how it goes! Put mixture in a bowl and add the rest of the ingredients, mixing well. Grease and quinoa flour a pan of your choosing, put batter in and bake. Bakes about 15 minutes, depending on oven and pan! In the pictures here I put a handful of blueberries in and it was perfection! I also finished it off with some sliced almonds, shredded coconut and a drizzle of maple syrup. **Quinoa flour: you can either buy it or make your own! To make your own toast quinoa on a sheet pan for about 5 minutes - until you can smell it and notice it browning a touch. Let cool. Put in blender and make into flour! When I worked at Restaurant Daniel I was in charge of the Ice Cream station. This meant I made and churned all the ice creams - and got to taste them all straight from the machine. If you're an ice cream lover (like me) and have never had fresh ice cream straight from the machine you are truly missing out. So simple, So divine. It's really pretty easy to make your own batch - and you can make exactly what you want flavor-wise. I whipped up a batch of Strawberry after asking my son what kind we should make. Now strawberry is certainly not my favorite flavor. I'd order Vanilla over Strawberry. I also would've liked to put some other things in it - maybe coconut or balsamic? - but being the good natured Mother that I am I gave him his simple Strawberry. And really - his praise after trying it made me thankful I didn't try to sneak anything else in. No - this isn't Vegan... I'll work on that recipe next... I am, after all, a classically trained Pastry Chef! Went back to my roots on this one! In a bowl toss strawberries, lemon juice and sugar. In another bowl whisk together egg yolks, sugar and 1/2 cup of the heavy cream. In a saucepan put the rest of the heavy cream, half and half, salt, cake spice and vanilla bean over medium heat. Bring almost to a boil. ‘Temper’ the hot cream mixture with the egg mixture by adding some of the hot cream to the eggs while whisking. Add egg mixture to saucepan and slowly heat while using a rubber spatula. You are making an anglaise here (which is delicious on it’s own!) and want to be careful not to over cook and ‘scramble’ the eggs. Stir well and use this trick to tell if it’s done: lift rubber spatula out of pot and draw a line across it with your finger – the mixture should be thick and hold the line. Pour into a bowl and chill. Puree strawberry mixture in a blender. 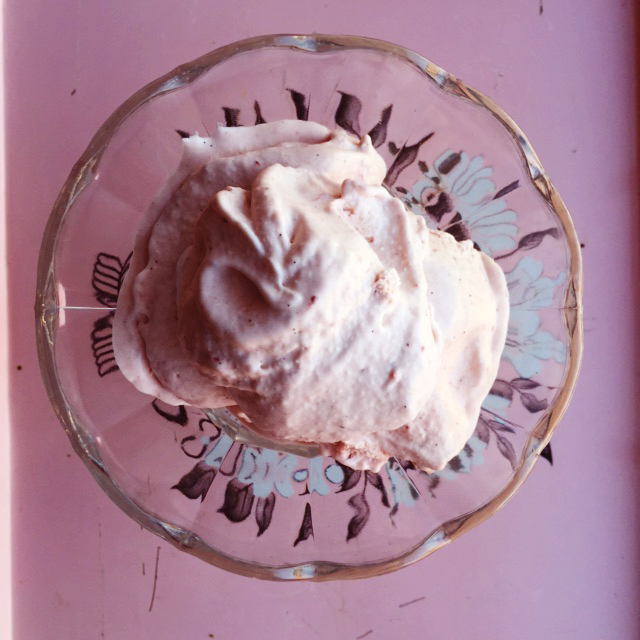 Add anglaise to your ice cream maker and turn on. My machine has a little window to pour extra ingredients into – so I poured the strawberry puree once it started processing. I meant to make the Sunflower Pate - but that didn't happen. Do you ever find yourself walking down the produce isle and grabbing things instinctively with no apparent reason? Well, that's what happened to me. Maybe I was thrown off because the store was packed with blizzard preppers - or maybe I was divinely guided to those leeks. Growing up my Mom always had packs of potato leek soup on hand. Knorr - the yellow and green pack - a flash of nostalgia and comfort in a cup. Texture, Taste, Color. I see her in her pink and purple robes. Intense 80's makeup. So I find myself chopping and throwing things in the pot. 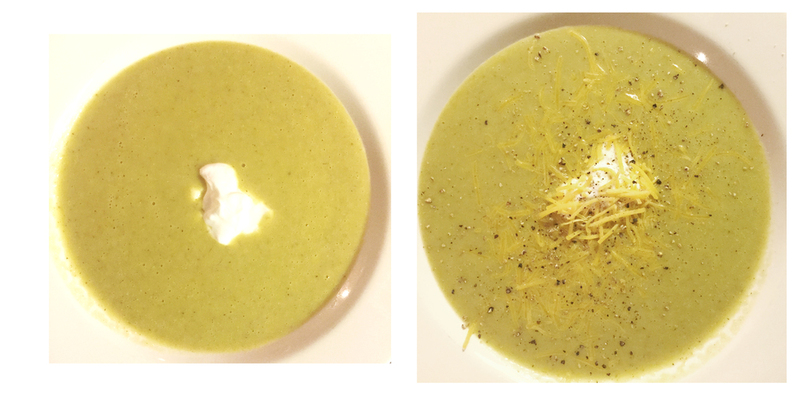 I've never made potato leek soup from scratch. Would it add up? Ginger, celery and a dash of turmeric. I've accepted that pretty much everything I make is bold and slightly Indian in persuasion. I clean the leeks really well - because who wants sand in their soup? The smell of sauteing onions and leeks fills the house. That old 50's house wife trick - sauteing onions before their husbands got home from work to make them think they'd been hard at work in the kitchen. It works for me. I'm in the zone of chop - dash - stir. A trance of actions that leads me to my destination. It's not a chosen destination - it's a moment by moment unraveling. It worked. I got that bliss in a bowl. The beauty of the bliss ball? It's totally open to your interpretation. Kind of like a smoothie - there are infinite possibilities of taste sensations to suit every palate. And they're easy - sweet morsels of goodness ready to pop into your mouth when that sugar craving hits. I whipped up a batch of them this morning - 46 of them to be exact. I expect this will tide me over for the next few weeks. But I also expect I will be making more of them just so I can test out different varieties.... who wants a box of bliss balls? A word of advice - be sure that your dates are pitted before throwing them in the Vitamix. In my haste to make them before taking Duncan to Tae Kwon Do class I forgot to check. I wondered what that terrible sound in my blender was... but I kept on trying to power through. After a few times of some really horrible noises I stopped and dumped out all the dough. I must say the Vitamix did a pretty good job of chopping some of those pits - but another thing I learned was that those pits are REALLY hard. In a food processor or Vitamix - process all ingredients except coconut. If too dry add a bit more water or oil. Let sit for 10 minutes (the mixture will thicken from the chia seeds) - or put in the refrigerator. 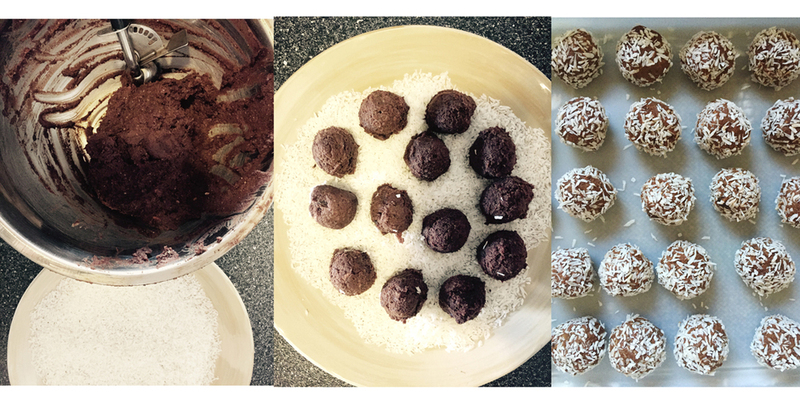 Roll into balls - Roll in the shredded coconut. I used a purple scoop for those of you that use pro food scoopers. **I found this Digestive Ghee at Kalustyan's in NYC - It's delicious... if you don't have it or want to keep it vegan - no problem - just use more coconut oil. I love granola bars. It's really the perfect food. Kind of like a banana except that a banana can get smushed too easily in your bag. Ready at a moments notice when you're hungry and there's no good food around or you just don't feel like stopping to get some. There it is. Waiting for you in your bag. The granola bar. A great thing for kids too. As a Mom it feels like your doing some worldly good deed when you feed your kids good food. That it will somehow prevent them from having a melt down and fill them with the important nutrition needed to face the world. Assuming that it's not filled with sugar, which most of them are, because then you will be doing yourself and the world a great disservice and laying the tracks for a meltdown that most certainly will happen in the near future. I've done dozens of recipes at this point - perfecting just the right balance of sweet and healthy. We're all looking for that 'treat'. A small indulgence - especially when you're on a 10 day cleanse or when you're having a long day of battle of the wills with your toddler.... So with those two thoughts in mind last night I came up a raw cacao kale bar! It may sound intimidating or unappetizing - but let me tell you - I basically made a brownie that happens to be healthy.... SERIOUSLY! I fed them to a group of cleansers this morning and it was all rave reviews (maybe they were just grateful to have something other than steamed veggies and salad). But then I fed them to my 3 1/2 year old son this evening and he wanted more, more, more, more (as he likes to say...). So I'm happy. I've managed to sneak greens into his diet AND have a delicious treat to eat. I've also managed to finish this post - The first part I wrote over a year ago. My how time flies. Now I don't have to go through the effort of coating it in chocolate - it's already in the bar. And we can continue to love our fruit and nut bars just as they are and I can stop caring that Duncan doesn't like them. And did I mention that all the bars are gluten free, vegan and maple sweetened? Bonus. It was one of those days. Is my head really that much in the clouds? Sometimes it's better to know exactly what you're eating. And sometimes it's better to not know and unravel it with each bite. I missed my subway stop on the way in to work today. I got on the wrong train leaving work. I was blasting music in my headphones and eating the bag of chocolate covered almonds I bought. Dark chocolate covered almonds are my passion. So perfectly sweet, bitter, crunchy. I was disappointed to see the bag as I pulled them out - they were milk chocolate. Had I not noticed when I bought them? As I was crunching down on about the fifteenth one I realized that in fact they were not milk chocolate and without looking at the bag I remembered that they were cappuccino almonds I had bought. It sounded interesting at the time and I had forgotten the whole moment (which was just a few hours previous). All of the sudden the taste in my mouth was one of an unraveling flavor bursting up against my taste buds in a whole other way. When I had thought they were milk chocolate it was just alright but when I made the taste translation to cappuccino they all of the sudden took on different meaning in my mouth. Is that taste prejudice? I wondered. The dimension of flavor was completely different than milk chocolate. How had it taken me until the twentieth almond to figure this out? Mindless eating. Pockets of time that the mind floats to and can't be called back from. I try to exist with present moment awareness. It's a constant task of being aware of sensations as they surge through your body (vipassana meditators will understand this). Distraction of flavors. Distraction of thought. Distraction of past and future. I made it home. And continued to enjoy the almonds until they gave me a stomach ache. Sometimes I don't know when to say stop. Why is easter about colored eggs? Why are all holidays about food? Comfort. Gathering. Community. Some greater purpose. Calling family. Well Wishes. My mom says she's trying to stay calm. Holidays freak her out and put pressure on an already fragile composition of nerves. So she goes on a 7 minute rant about the immediate stress in her life and wishing people would die. Sounds morose, I know. But that's what happens. Total honesty. On the raw leading edge where no filters exist. I juggle it with a grain of salt and go back to my beautiful blue eyed son who is staring at me through the most angelic eyes. Holidays are about the kids. That's what everyone I called tells me today. People who's kids are all grown and they are living on their own now. You can hear it in their voices - missing that carefree happiness that engulfs the little ones that so often leaves the grown-ups. But back to the food. Any excuse to make a meal - make a cake - make a moment in time stand still. A mushroom omelet with jalepeno cheese. Home fries. Baguette slathered in fig jam. Strong french press coffee. A perfect meal. I'll settle for store bought Easter candy for dessert - no time to make a cake these days. There's something nostalgic and fulfilling about York peppermint patties and Reese's peanut butter cups. Cooking is therapy. There's no way around it for me. Start chopping and spicing and concocting a dish and you find your way home. I'm standing in the kitchen. Staring into the fridge. What do I have. What do I want. What lines up. It's a game I like to play. Make it come together with what's in front of you. If you think too hard you'll miss the point. People (who obviously don't know me) like to talk and contemplate the extent of my mental state. The post-holiday musings post was too real. But what's life without the truth? You can't have the highs without the lows. You know this. How can anyone dare to ask, undirectly, what's in someones mind. If you want to know you'll have to go to the source. That post wasn't meant to be scary or dark. (You should have seen the first few drafts I tried to write - that was scary and dark). It was meant to be real. Truth. And it's a public forum - so open to debate and crticism - but it's also exactly that - open, honest musings. Do we take everything too literal? Maybe so. But don't ever guess and think to know what's really in someones mind. So, I'm back to cooking. And baking. In stride. I like to make the people around me as happy as I can. And gifting cookies and dinners always seems to please. It's from the heart. It has a little bit of me in it. And the act of doing it works out the kinks in my mind. As we all have an overactive mind that goes down dark corridors and pathways trying to make sense of what's happening around us. I chant into my food. I immerse myself in flavor combinations. I become one with what's in front of me. I truly loose track of time in the most beautiful way. Everyone should be so lucky to find something like this in their lives. And I give the gift of food to my son and my friends around me hoping that they can taste this in every bite and know that all is right in the world. I've got cookies on the brain. So simple. So good. So versatile. Endless combinations of ingredients - though I must say the basic chocolate chip cookie is still my favorite. It's like wrapping your favorite blanket around yourself - a moment where all is right in the world and nothing can change the pure simplistic goodness that envelopes my being. I'm walking down the street - chocolate chip cookie in hand - and with every bite I take all my temporary problems of perceived confusion melt away. I get more pep in my step and whatever I was thinking about before this cookie is magically solved and transformed. At least for the moment. Yes, the power of the cookie. I see it in my son too. The two year old temper tantrum? Tell him you have a cookie. He may just change his mind about kicking and screaming for no apparent reason. I know, it's bribery starting at a young age. But hey, sometimes we just need some positive motivation. And here's the other thing about the basic chocolate chip cookie recipe - you can come at it like a chef and depending on your mood throw in different ingredients. My friend asked me to whip up a batch of cookies for him the other day and I threw in cocoa powder, cinnamon, walnuts and cayenne pepper. Bliss. I know that takes them to the level of a chocolate-chocolate chip cookie. But my point is to experiment and take the plunge. If it goes terribly wrong you can always grind them up and use it as a crust for something else. Add more butter and layer it in a cheesecake. The possibilities are endless. It mirrors life in that way. It's all in your hands. Create your own perfection. I grabbed an oatmeal raisin cookie the other day. Perfect balance of crisp butter crunch and soft chewy raisins. It was definitely an oatmeal raisin kind of day. Chocolate chip would have been too intense. It was morning. The first thing I ate. There's a cookie for every mood. Figure out your mood through a cookie. Stir the batter, scoop it out, bake it in the oven and ENJOY. That's what life is about, no? Thanks to my super amazing friend Ali Kavoussi. It was for Muse Magazine hosted by Marina Abramovic at the Gramercy Park Hotel. Good things come in petit packages. It's true. Especially when you are traveling and don't have room to carry anything. And it's even better if said thing is edible and you can carry it in your belly and not in your bag. Like chocolates. Oh, chocolates.... So many to choose from. I was happy to find Patisserie Demoulin just down the street from where I'm living. I'd read about it a few times but never been. It's a classic - having been there for over 40 years. And it's cute. With a thatched straw roof decorating the outside it almost seems odd sitting on Boulevard Voltaire - out of place in time and space on a stretch of street that is ruled by strange pawn shops and dry cleaners. The first thing I got was an almond croissant. Wow. It was almost too buttery for me to fathom... and lord knows I love butter. That didn't stop me from eating the whole thing but it did leave me wondering whether or not I should have. I then moved on to a small chocolate chip financier with a dollop of chocolate in the middle. Now THIS was devastatingly delicious. I was sorry it was over in three bites. But I savored those three bites to the max. You know when you close your eyes and revel in the flavor / texture / sensuality of something? It's pure bliss. That moment when nothing else matters and all thoughts cease to exist? And then it's gone. Sometimes it lingers around a while reminding you that there are pockets of time you can dip into. When the world pushes against you and you can palpably feel the pressure on your skin... It's a meditation of flavor. Days later I remembered the tiny box of chocolates I bought. Sitting on my kitchen counter looking nonchalant with it's modest twine tied around it. Four chocolates awaited. One bite... (oh, this is good).... two bites (wow, what is this?).... three bites (should I be sharing these with someone?!).... four bites (here comes Duncan).... And then they were gone. My petit box of chocolates savored to the last bite. Every bite was a cosmic burst of pure genius. That melt in your mouth divine feeling that calls upon your every sense. This one isn't edible but delicious in a whole other way. I stumbled upon this jewel box store while out wandering around a few months back. It's black walls are lined with glass boxes that house the hand crafted jewelry. Corpus Christi is it's name. Tiny sculpted wings, skulls, arrows, feathers.... it's the kind of place you walk into and just want to buy everything. I can't help myself... I love jewelry. I love the stones (and all the properties they bestow on you), the craftmanship and the way it has the ability to transform my mood. I guess it's like food in that way to me. A shift in perception. An appreciation of beauty. A moment carved out in a busy world. The oxymoron of my life, pastry chef / fashion model, plays out seamlessly. Things that don't seem to go together find common threads and co-exist beautifully. I'm often asked about this. People wonder how it works. Transformation, meditation, a lifting of the mundane. A quest for magnificence. And now thanks to Joshua I can soar like an eagle through this game of life. I love my new necklace. And I love petit packages. The anticipation of what awaits inside is always so much fun. Where do I begin.... Anyone that knows anything about food (or should I say sweets) in Paris knows about Angelina's. The famed, the amazing, the sublime... Angelina's. I've been coming here for 20 years and it has never failed me. The place to start, I suppose, is the African Hot Chocolate. It is assuredly unlike any other hot chocolate you have ever tried. Thick, rich and perfectly balanced. With an intense chocolate flavor not for the faint of heart. The best part is that it's served with a side of whipped cream - so you can be in control of diluting it to you liking, changing the drink back and forth from strong to creamy as you drink it. Imagine. A carafe of drinkable chocolate - a bowl of fresh whipped cream - served to your table in an atmosphere of gilded gold. There are few things better in this world. The other thing they are rightfully famous for is the Mont Blanc. This is a desert I would normally not be fond of. I don't like meringue - in any form. I'm appalled at the big clumps of it being sold throughout France (and Miami - it's also loved by Cubans). But it works so perfectly here that I'm able to transcend my dislike of it and embrace it. So this is what a Mont Blanc is: meringue, vanilla whipped cream and chestnut puree (that's the noodle looking stuff on top). It's a perfect balance of not too sweet, creamy, crunchy, smooth, earthy, can't stop eating it until it's done divineness. Did earthy throw you? The chestnut puree has that sense of frolicking through the forest, not quite sure what it tastes like, fluffy, understated magnificence. That's what I mean by earthy. I'm not sure if the whole thing is an acquired taste of sorts, but I have come to love it. Anything else that you order from here will be great. It may not have the exact finesse of Laduree (which will be another post) but it will be delectable and bring happiness to your life in that moment. Wandering through the streets, past the Louvre, through the Tuileries... life is grand. How can you argue it when you've just tasted the decadence of the angels? How many baguettes is too many? I asked myself this question the first week I moved to Paris. After seeming to go through baguettes so easily I wondered if there should be some limit on my baguette consumption. I'm not usually one for restrictions - the sheer thought of it makes me want to do the opposite, just because. But I wondered if there was a time and a place. A friend advised me that the baguettes would let me know when I had overstepped my allotted consumption, and though I do believe in strange happenings, I don't bank on my baguette talking to me. So, I carried on about my baguette eating days and forgot about the question of limits - I was living in Paris after all. You can tell a lot about someone by the way they eat their baguette. Biting the end off just after buying it is so irresistible.... fresh out of the boulangerie it begs to be bitten. I wondered if this was rude - somehow lacking in manners. With baguette in hand it somehow didn't matter what the rest of the world thought. What's that Wayne Dyer saying - "what you think of me is none of my business" - yes, that's how I choose to walk through the streets of Paris eating my baguette. Then there is the matter of once you have it home do you cut it with a knife or pull it to pieces with your hands? One little bit at a time. Cutting it implies some sense of order. Some deeper plan. Some boundaries of control. Who doesn't wish to make order and sense out of this life that we live? But cutting my baguette isn't going to help me with this matter, I quickly realized. The best thing to do really is let Duncan grab the baguette from it's bag. He always seems impressed with it as he wanders around munching it's perfection. It can't really be thought of as a 'loaf' of bread. Or so I told myself. I found comfort in seeing people walking through the streets with four baguettes in their bags. Who were they going home to? How many people lived at that home? Or was it all just for them? We were taught in culinary school that the shelf life of a baguette is 7 hours. It seems to go hand in hand with French culture. They buy fresh food daily. None of this buy for the week mentality. And so I concluded that the baguette can and should be bought freely without a thought as to how many is too many. Other people around me didn't seem to have this question - and even if they did - it wouldn't be any of my business to judge, right? VANILLE. It's intoxicating to me. Whatever form its in - Perfume, tea, ice cream... I could happily eat only the vanilla side of a black and white cookie. I don't drink coke, but make it vanilla coke and I'll have some. It makes everything better. It's like taking a happy pill. Smother me in the scent and taste of vanilla and all is right in the world, if only for a few moments.So imagine my delight at grabbing this vanilla yogurt pot from the grocery store. Just your typical grocery store and just a typical french yogurt. But dear god. One bite and I was holding onto the kitchen counter for stability as my knees buckled out from under me. It couldn't have been more sublime. I wanted to dive into that little pot of bliss and drown myself in it. Instead (seeing as the pot was quite small compared to my body), I ate the whole thing promptly. There is a thin line between the joy and the ordinary. Things float by all day long. Depending on how we look at them can change our whole day. Our whole life. A moment spent swooning over the explosion of taste in our mouths can alter our outlook on everything that follows it. Time stands still. Other dimensions open up. The next thing I picked up while running around town was this little vanilla yogurt drink. Again, nothing fancy, nothing special. Could it be true?! It was like melted vanilla ice cream swishing down your throat. I gulped the whole thing down while wondering how Americans could have it so wrong. All it takes is some real vanilla beans and some real yogurt. Realness seems to get lost somewhere along the way. Bouncing back to a time when things slowed down. To savor a moment, a day, a week. Things hurry by at lightning speed. I wonder if there is a vacuum bag full of unexperienced moments that have passed me by. A failure to grasp, understand, hold on. But holding on is a useless act as well. Perpetual motion. We are all in perpetual motion. And here I am. Standing on rue St. Michel. Wondering where all these people are going in such a hurry. In the blur of humanity I wonder if in these moments I will remember. Remember that all is right in the world. That nothing can take away this moment. And though things float by at feverish speeds there will always be this moment. To savor.